Shown are, top to bottom, left to right, Bryan Daehling, Mr. Wilhelm, Jesse Craig, Janie Wallace, Cady Perry, Taylor Cordial, Ashlyn Dunn, Justin Preece, Nick Crumley, Emily Tate, Ashley Gemienhardt, Kirstin Lewis, Mackenzie Carter, Rachael DuLaney, Mrs. Zachrich, Olivia Maurice, Conor Thomas, Ally Pierce, Magdaline Perry Jess Salyers, Hailey Combs. Urbana FFA students left early May 3 to attend the annual state convention. Held in Columbus, the convention lasts two days. When the students and chaperones arrived in Columbus they went to the Anthony Thomas Chocolate Factory. After the group departed from the factory, they went to the Ohio Department of Agriculture for a tour. After both tours the students and chaperones went and ate lunch, and then headed to the convention center. 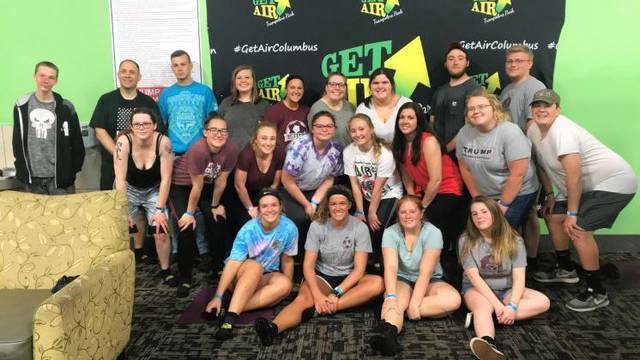 After attending the convention for a while the students and chaperones checked into the hotel, then attended a chapter bonding session at Get Air Trampoline Park, then attended dinner at Bj’s. Following dinner the students and chaperones then went swimming and played games back at the hotel. On May 4, the students attended the career show and learned about chapter activities from across the state. Also the students attended the third session which had the NCA awards. FFA officers got awards for their books, Urbana FFA officers Ashlyn Dunn, Jesse Craig received gold ratings on their books. Later in the day students attended the State Degree ceremony, the recipients from the Urbana FFA chapter are Olivia Maurice and Jesse Craig.